I especially enjoyed this dish because with each bite, I got a little of both sweet and savory flavors. 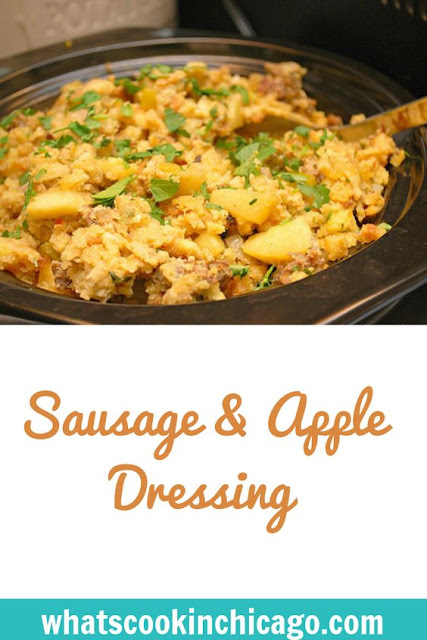 Although the recipe calls for sage pork sausage, you can use regular pork sausage and add 1 tablespoon of poultry seasoning and fresh chopped sage for the same effect. As for the apples, I highly recommend Golden Delicious apples because they do well in cooked recipes and will hold their shape. This is definitely one I plan on making this year for guests and I highly recommend it! 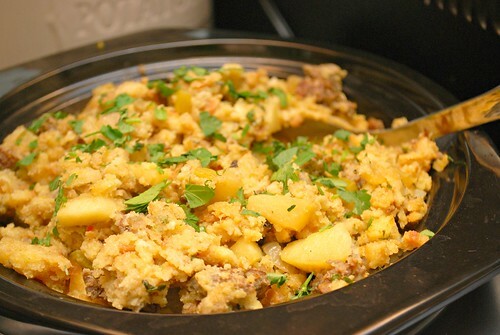 Put the stuffing cubes in a large bowl and set aside. Butter a 3-quart casserole dish. Melt 2 tablespoons of butter in a large skillet over medium-high heat. Brown the sausage in the skillet and transfer sausage and pan drippings to the bowl of stuffing cubes. Melt the remaining butter in the pan. Add the onion, apple, celery, and salt; cooking until softened, about 5 minutes. Pour the vegetable mixture over the stuffing cubes and toss until evenly moistened. Add the broth, parsley, walnuts and eggs, stirring with the stuffing cubes until combined. Transfer the dressing mixture to the prepared pan and cook uncovered until the top forms a crust, about 40 minutes. Drizzle about 2 tablespoons of turkey pan drippings or melted butter over the top and continue baking until the top is crisp and golden, about 20 minutes more. Set immediately or warm.